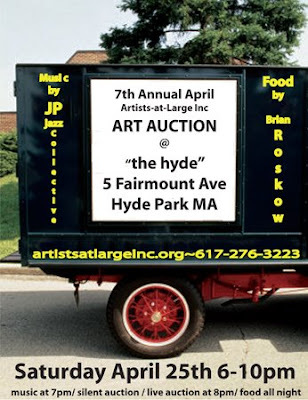 their 7th Annual Art Auction, 6pm-10pm at The Hyde Restaurant (formerly Dotties), 5 Fairmount Ave., Hyde Park, MA, 02136. Music by the JP Jazz Collective will begin at 7pm as part of Boston's Jazz Week performing original arrangements of classic jazz of the 1950’s and 60’s. There will be a Silent Auction for Artists-at-Large and light refreshments will be provided. A surprise live auction item will be announced at 8pm, and all bidding ends at 9pm. The silent auction will feature very affordable artwork from many local and international artists. Join the fun and see how Hyde Park institutions are reinventing themselves to better serve Hyde Park and surrounding neighborhoods in the coming years. Artists-at-Large opened on April 1st, 2002 in Hyde Park and has remained active in the neighborhood recently moving into an office at 1 Westinghouse Plaza. Artists-at-Large, under the leadership of Thomas Seggers, programs concerts, classes, trips to nearby museums and cultural events, and art exhibits hosted by the Riverside Theatre Works. Artists-at-Large is committed to its mission of bringing art, in all its forms, to Hyde Park and beyond. JazzBoston was formed to bring together people who care about the present and future of jazz in Boston, and to share the challenge and the excitement of carrying Boston’s rich jazz legacy forward. the JazzBoston mission is to support the city’s jazz community in its broadest sense by building and serving audiences for jazz music, expanding performance opportunities for jazz musicians, and raising Boston’s profile as a jazz city. Jazz Week, from April 25 to May 3, is the third annual celebration of Jazz Week features more than 200 events, many of them free or low-cost, in over 75 venues all around the Greater Boston area. See local art and hear local music TOMORROW in Hyde Park, and support local arts organizations by bidding on a piece of art in the auction by Jessica Burko of Reclaimed to You!